The beautifully detailed bust of a Thoroughbred horse will be created using your own horse's hair. This special way to remember a current horse friend, or a past favorite will grace your desk, table or mantle for years to come and remind you of that special equine. 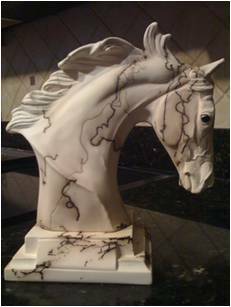 Horsehair pottery is created by draping the horsehair over the pottery when it is removed hot from the kiln. The carbon markings that remain are unique to each and every piece ~ no two are ever alike. This piece is 8" tall x 9" wide. The square base is included. ~Add text to this unique piece by adding an engraved plate at the front of the base, done in black with gold lettering. Perhaps your horse's name, a commemorative date, or phrase will make this piece even more special to you. After placing your order, you will receive an email with instructions on how and where to send your horse's hair and photos for this colorized piece. For this bust, we'll need a minimum of 30 pieces of horse hair. My husband was in tears when he received this of his horse. Knowing that this was made with his horses hair was over the top! All I know is I will be his favorite forever! !